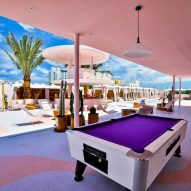 Guests stay in candy-coloured rooms at this art-deco-influenced hotel in Ibiza, while artists in residence are offered a transparent suite in the lobby. 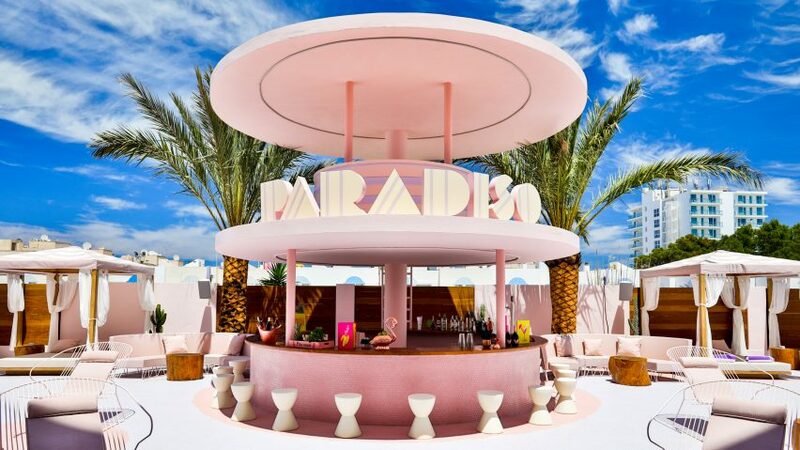 The Paradiso Ibiza Art Hotel opened last month on the Balearic island's northwest coast, not far from the infamous nightlife in the resort of San Antonio. Its mission is to offer an alternative to other accommodation options on the party island, by hosting a comprehensive arts programme for guests and other tourists to enjoy during their stay. "Devoted to art and contemporary creation, and borrowing inspiration from the aesthetics of MiMo – Miami Modern – the new hotel introduces a whole new way of visiting the island, surrounded by high-quality art," said a statement from Concept Hotel Group, which operates the property. 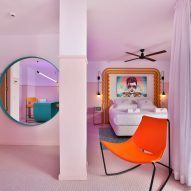 Designed by Spanish studio Ilmiodesign, the hotel's stark white exterior and simple shapes – enhanced by coloured lighting – is reminiscent of the art deco architecture found along Miami Beach. Meanwhile, the candy hues and scalloped details found inside are more akin to the 1980s Memphis design movement. 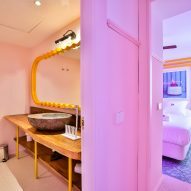 This style is evident in the guest rooms, which are decorated pink, yellow or green depending on which level they are situated. The suites vary in size – some offer lounge and kitchen areas populated with furniture in clashing colours, and others afforded access to balconies that continues the hues found inside. 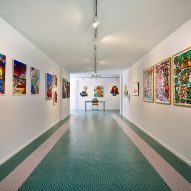 Hung in the rooms are works by artists affiliated with the hotel's art programme, directed by artist and curator Iñaki Domingo, and photographer and filmmaker Diana Kunst. 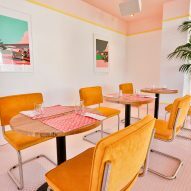 "Guests will be completely surrounded by art in a unique setting, with works by contemporary artists installed in all the hotel's Art Rooms," said the hotel's statement. One of the rooms stands out even more than the rest. Situated in the lobby, a glass-enclosed sleeping area known as Zero Suite is reserved for artists that can complete "micro residencies" at the hotel. Available one weekend per month, the residencies encourage international participants to create site-specific interventions during their stay in the bright yellow area. Continuing the focus on art, the hotel has its own gallery that will host three exhibitions during each high season, and an Art Library that allow guests to browse contemporary works year-round. 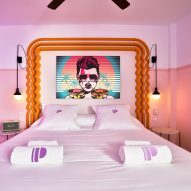 "Paradiso Ibiza Art Hotel aspires to become a benchmark for the local art scene," the hotel said. Elsewhere, the lobby features pink mosaic tiles laid across the floor to match the painted walls and ceiling. Stripes of green run through the central area, around the reception desk and a banquette upholstered in bright red. Outside, the pool area continues the pale pink and purple tones. 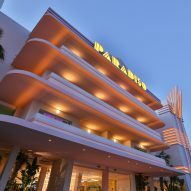 Two rectangular swimming pools are positioned either side of a circular bar, which echoes the building's art-deco flavour, and is topped with lettering that spells out Paradiso in a similarly 1920s-esque typeface. Cabanas and loungers are placed around the water, while a pool table and cafe seating beside the building are shaded from the Mediterranean sun. Hotels around the world use art to provide unique experiences for their guests. Casa Malca in Tulum, At Six in Stockholm and The Jackalope on Australia's Mornington Peninsula all boast impressive collections for those staying to appreciate.